Q. When is the next York Proms? 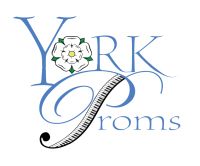 The next York Proms is Sunday 14th July 2019. Gates will open at 4.30pm for fast track and disabled ticket holders. Final show times will be posted once known. Q. When will 2019 tickets be on sale? Tickets will go on sale at 9am on 1st October 2018. Tickets (in the form of wristbands) will be sent out 28 days before the event, by recorded delivery. Tickets booked after 1st July will be available to collect on the gate (main gate on Museum Street) on the day. Q. Where do I collect tickets? For tickets booked near to the event and not posted out, box office collection will be on Museum Street from 4pm. Disabled ticketholders will be able to collect theirs from the Marygate entrance. Q. How do I book using my Activity Superstore gift experience? If you have an Activity Superstore voucher to claim you can book by visiting the online shop and choosing the Activity Store Voucher item. To complete the transaction you will need to select "Click here to pay with Activity Store voucher"as your payment method and enter your voucher number and activation code. If you are unsure which numbers to use you can leave it blank and we will get in touch to complete the order. Q. When will tickets be taken off sale - can we buy on the gate? Tickets are ONLY able to be booked in advance. Please note NO tickets will be sold on the gate on the day. The online box office will close approximately 48 hours before the event, or when the event sells out, whichever is sooner, so don't leave it too late to buy your tickets. You can buy at Visit York until midday on Saturday or until sold out, whichever is soonest. Q. What time do the gates open and what time does the show start? The gardens will close in advance of the show 3pm and reopen on both Museum Street and Marygate shortly after 5pm for people to enter. The main evening show start time is yet to be confirmed, but we recommend being seated on the lawn ready to watch the show by 7pm as we expect it to begin at 7.30pm. Those people with fast-track tickets and disabled tickets will be able to enter 30 minutes earlier, at 4.30pm. The fast track queue will be signposted. Q. What time will the event finish? Q. Can I Use the Park and Ride? All tickets will be sent out 28 days before the event. Tickets will be in the form of single-use wristbands, that need to be worn on the day. Instructions will be sent with the wristbands. If you haven't received your tickets by 30th June please get in touch. Q. I haven't received an order confirmation email, what should I do? Firstly, please check your junk folder as it is very rare for a confirmation email not to be sent out. If you cannot find it, or it has already been automatically deleted, please send us a message via the contact page and we will look into it for you. Q. Can I re-sell or give away my tickets? Tickets are non-refundable and non-transferable. If you find you are no longer able to go, or you have bought tickets as a gift, please get in touch and we can help. Q. I can't go anymore, what can I do with my tickets? If there are genuine, unforeseen reasons you cannot go please get in touch. Entirely at our discretion we may be able to help by re-selling your ticket to our ticket waiting list, if the event is sold out, or we may be able to roll over your tickets for the following year. Please get in touch as soon as you know you are unable to attend. Q. How many tickets are for sale? The maximum number of tickets available is 2,000. Tickets are sold strictly on a first come, first served basis. Last year we had to reduce the number slightly because of a loss of lawned area due to falling masonry from the ruins, so this could happen again and no notice will be given - the box office will be closed without warning. As the seating is unreserved for standard ticket holders you can always buy extra tickets if you're unsure of the number in your group, so be conservative in the number of tickets you think you will need, then add to it later if other people decide they want to come with you. Q. Can I bring picnic furniture? You may bring folding chairs, picnic blankets and standard size umbrellas. Please do not bring gazebos, parasols or disposable barbeques. Ticket holders are kindly asked NOT to spread out with space in between your group. If you leave gaps someone may end up sitting in it as we do not have the space for everyone to spread out. Please do not use furniture or string to rope off an area for your group as you may be asked to remove this so other people can be seated. Yes, the Museum Gardens is wheelchair accessible but please be aware the audience will be seated on the grass. This may become more tricky for wheelchairs if the weather has been wet and the ground is soft. We plan to have a designated area for wheelchair users this year but you're not obliged to use this if you would rather sit elsewhere. Q. Is there a carer ticket for disabled ticket holders? Disabled and carer tickets can be booked with Visit York information centre. You will be given specific wristbands on the day and you must arrive together. Q. Where will the stage be positioned and is it different to last year? The stage will, again, be positioned on the terrace in front of The Yorkshire Museum. We will also have a second stage to house a full choir. Please note, ALL these plans may change due to circumstances outside our control on the day. Q. Is there a fireworks finale? Yes, all being well with licensing and legal issues, there will be a fireworks finale similar to previous years. The fireworks will be fired from behind the abbey ruins this year, unless circumstances beyond our control on the day prevent sthis. Q. Can I buy refreshments on the day? Yes. There will be a range of local suppliers to keep you fed and watered. We will have hot drinks, soft drinks, alcoholic drinks, cakes, etc. Q. Can I bring a picnic? Of course, we encourage audience members to bring a picnic and enjoy the day. You may not bring barbeques or use naked flames. Please avoid bringing large, sharp kitchen knives that could be hazardous and please bring plastic glasses, not glass. Q. Can I order a picnic to collect on the day? Yes. We will have picnics available and they will be available to order soon. The show must go on! As with all outdoor concerts held in the UK, a bit of rain won't dampen our spirits and the show will continue as normal. Please check the weather forecasts and come prepared for rain or sun, ensuring you bring rain macs or sunblock, depending on what is needed. The only time the show would be cancelled is in the event of extreme inclement weather, including very high winds that make it unsafe to use the stage. In this case the promoters will do their best to contact everyone to inform them. The promoters take no responsibility for cancelled hotel or travel costs, but these can often be recovered with travel insurance policies. Well behaved dogs, on a lead, are permitted. However, if your dog affects the enjoyment of other guests by barking at the stage or causing a nuisance you may be asked to leave. Be aware there may be a firework display, so please consider that when deciding whether to bring your dog. Also, please be sensitive to audience members around you who are not comfortable around dogs. Smoking is NOT permitted on the lawn area where the audience is seated, but smoking is permitted elsewhere in the gardens. Vaping is permitted on the lawn. Q. I want to perform at the York Proms, how do I go about it? We hope to have a community stage to showcase local talent, which will run soon after the gates are opened and finish shortly before the evening show. If you would like to be involved please send a message via the contact page. ​For professional artist enquiries please send information via the contact page. Q. Will the artist line up change? Although we make every effort to announce the guest artists in advance there may be times when a change to the programme is unavoidable. The promoter reserves the right to make changes to the programme. Q. Will there be toilets and baby change facilities? There will be toilets available, including disabled and baby change. There are numerous car parks around the city centre. The Park and Ride services close early on a Sunday so please see the information further up this page about how to find a work around for the park and ride. There is a car park on Marygate, but this will fill quickly, so be early to avoid missing out. Q. Will there be first aid on the day? Yes, there will be a first aid point for any problems that may arise on the day.